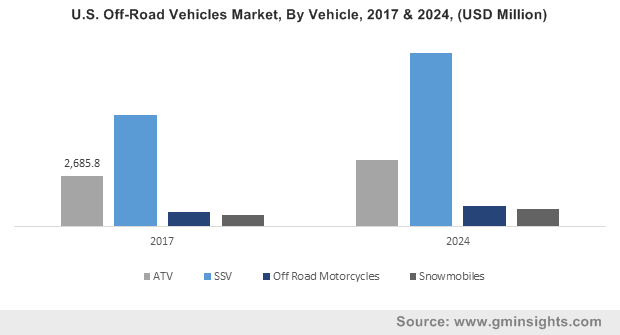 Snowmobiles « Global Market Insights, Inc. The growing acclaim for luxury adventure sports, especially across the urbane locales, has led to the commercialization graph of power sports market depicting a robust rise. Advanced power sport vehicles like jet skis, ATVs, snowmobiles, side by side vehicles, and on and off-road motorbikes have come to occupy a prominent position in the sports and entertainment industry. 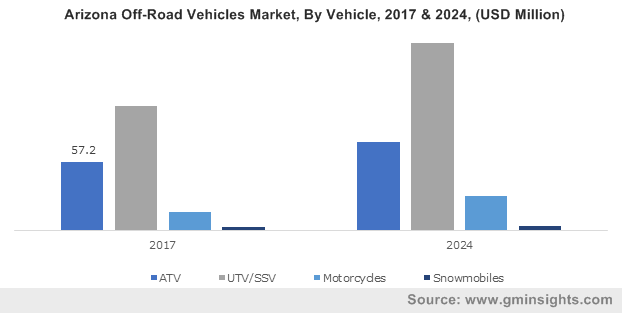 As the popularity of recreational activities continues to soar, the demand for these vehicles will also depict an upsurge, gradually propelling global power sports industry size. One of the most pivotal driving factors of power sports market is the expanding tourism industry. As per the World Travel & Tourism Council (WTTC), the travel and tourism industry accounted 10.4% of the worldwide GDP in 2017. The sector also accounted for 313 million jobs in the year – nearly 10% of the total employment in 2017. As the popularity of tourism exhibits an upsurge, the demand for luxury vehicles for recreational sports will depict a rise, gradually propelling power sports market size, that was pegged at USD 10.5 billion in 2017. Merely a week ago, Harley-Davidson launched a slew of technology advancements in its product lines that would help to enhance the function, style, and performance of its 2019 Harley-Davidson Touring & Trike motorcycle lines. At the beginning of August, Harley-Davidson partnered with rental company EagleRider, Inc. in a bid to activate over 120 dealerships as rental locations. Eventually, the partnership would add 700 Harley-Davidson dealerships as rental locations. Currently, consumers will be liable to tour popular destinations such as the Pacific Coast Highway and Route 66 through these participating dealerships present nationwide. Back in July 2018, Harley-Davidson confirmed the launch of a 975 Streetfighter – a high-performance motorcycle that may give competition to models such as Suzuki GSX-S1000 and BMW S1000R. Powered by a 975cc liquid-cooled V-Twin that will be incorporated in future models, the Streetfighter will be launched in tandem with the Pan America adventure touring motorbike integrated with a 1250cc version of the Streetfighter’s engine in addition to a skid plate, upright windscreen, and an off-road suspension. 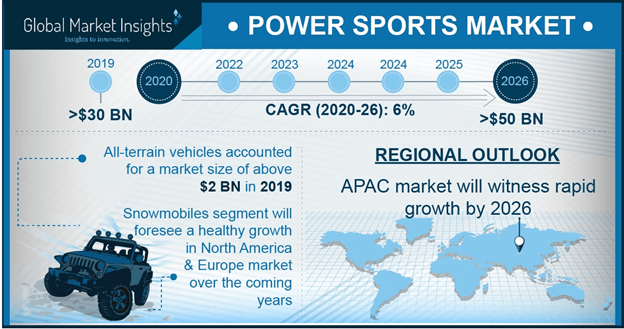 Apart from the contribution by leading industry players, North America power sports market trends are also likely to undergo a transformation on account of the initiatives taken by government agencies to enhance the consumer base of the region. Some of the leading government bodies involved in propelling the valuation of North America power sports market include the Federal Highway administration, the U.S. Forest Service, the Bureau of Land Management, the U.S. National Park Service, and the National Oceanic & Atmosphere Administration. The ongoing technological advancements in the automotive sector have been majorly responsible for the growth of power sports market, given that automakers strive to provide vehicles with higher efficiency, increased power, modern designs, lighter weight and better performance. Furthermore, luxury vehicles are now equipped with advanced features like Bluetooth connectivity, mobile tracking facilities, GPS navigation systems, electric starter and striking user interface displays to effectively meet consumers expectations. The increasing purchasing power of consumers across the globe in tandem with the ability to purchase inventory online has provided many manufacturers with novel growth avenues, gradually augmenting the revenue scale of global power sports market in the years ahead. This entry was posted in Automotive & Transportation and tagged All-Terrain Vehicles, Global Power Sports Market, Heavyweight Motorcycles, Personal Watercrafts, Power Sports Market, Power Sports Market Analysis, Power Sports Market Data, Power Sports Market Report, Power Sports Market Share, Power Sports Market Size, Power Sports Market Trends, Powersports, Side By Side Vehicles, Snowmobiles.